Peace talks are still ongoing between the Turkish state, representatives of the Kurdistan Workers’ Party (PKK), and PKK leader Abdullah Öcalan. It is likely that for any kind of peace to be secured they will have to go on for quite a while longer. 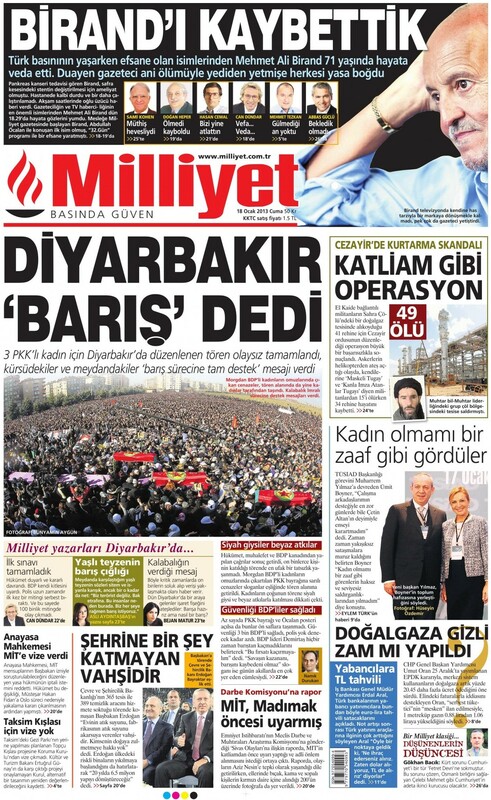 Looking at the attitudes adopted by the Turkish media over the course of the “İmralı process” has been illuminating, particularly the reporting of the Jan. 17 funeral ceremonies in Diyarbakır of the three female Kurdish activists who were recently shot dead in Paris. That the funerals passed peacefully was a relief not only for the government but also for the Peace and Democracy Party (BDP), which shares grassroots with the PKK. At the moment, both the Justice and Development Party (AKP) government and the BDP have a common interest in continuing the talks. For the process to come to a successful conclusion – still a long way off – this shared interest will need to persist for a while yet. Capital punishment was abolished by Turkey in 2002, just prior to the AKP’s accession to power in the general elections of that year. Although no execution had been carried out by the Turkish state since 1984, an official end to the practice on the Turkish law books was seen as one of the key steps in Turkey’s EU accession process, which was then entering its most energetic period. The decision was fairly controversial at the time, as PKK leader Öcalan was captured and sentenced to death by the Turkish authorities in 1999. With the abolition of capital punishment, this sentence was commuted to life imprisonment, and Öcalan has since been held in a remote prison on İmralı Island in the Marmara Sea. With the recent spike in clashes between the Turkish security forces and the PKK, Erdoğan’s words on capital punishment should be interpreted in terms of the government’s failure to solve the Kurdish question – populist sentiments aiming to deflect nationalist criticism that he has made too many concessions to Kurdish rights with little to show in return. 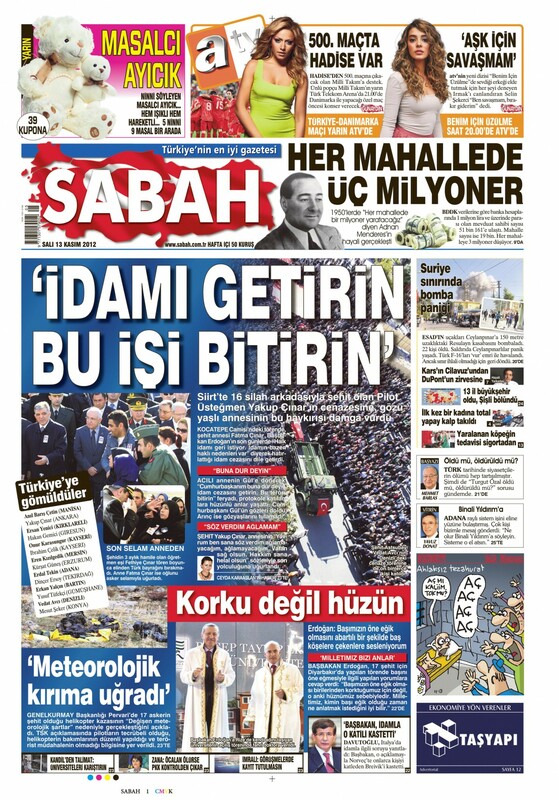 The most striking newspaper coverage of the issue I saw came from popular pro-government daily Sabah, the newspaper with the fourth highest circulation nationally. Its Nov. 13 front page carried the bold headline “Bring back capital punishment, end this business.” These were the words of Fatma Çınar, the mother of one of the 17 soldiers killed in the recent helicopter crash in the southeastern province of Siirt, speaking at her son’s funeral. The crash was not a result of direct clashes with the PKK, but it was enough for PM Erdoğan to frame it as taking place within “much intensified, multi-dimensional” military operations in the region. Meanwhile, the hunger strikes of 700 Kurdish prisoners today entered their 64th day. Despite the increasing urgency of the situation, Erdoğan has so far ignored calls to directly engage in finding a solution. He even spent Nov. 12 in his hometown of Rize, receiving an honorary doctorate from the newly-established “Recep Tayyip Erdoğan University” (it’s sometimes difficult to tell in Turkey that you’re not reading The Onion). His words on capital punishment have certainly been an effective tactic distracting some attention away from the critical situation of the strikers. However, like the Peace and Democracy Party’s (BDP) recent remarks about erecting a statue of Öcalan, they have hardly done much to help create an atmosphere congenial to a solution. The hunger strikes of 682 Turkish prisoners are entering their 57th day. The way that they – and the broader issues related to them – are being reported by media outlets known to be close to the ruling Justice and Development Party (AKP) clearly reflects the direction that the government’s Kurdish policy has recently taken. With the government’s “Kurdish initiative” apparently having run out of steam, the conflict between the Turkish security forces and the outlawed Kurdistan Workers’ Party (PKK) has become increasingly bloody over the last 12 months, and chances for a political solution seem to be ever more remote. The latest bloody incident in south-eastern Turkey took place in the Şemdinli district of Hakkari province on Nov. 4, when a car bomb targeting a military vehicle killed 11-year-old boy Faris Demircan and wounded 26 others. 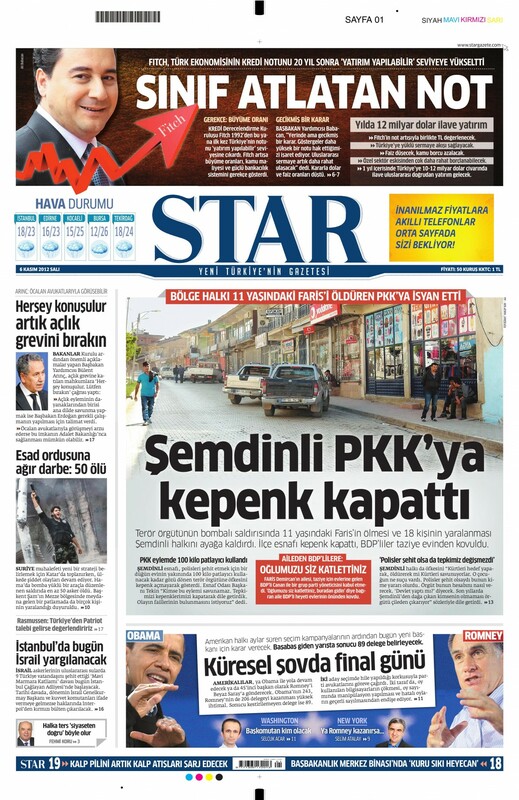 Although there was no immediate claim of responsibility, the PKK is widely thought to be behind the blast. 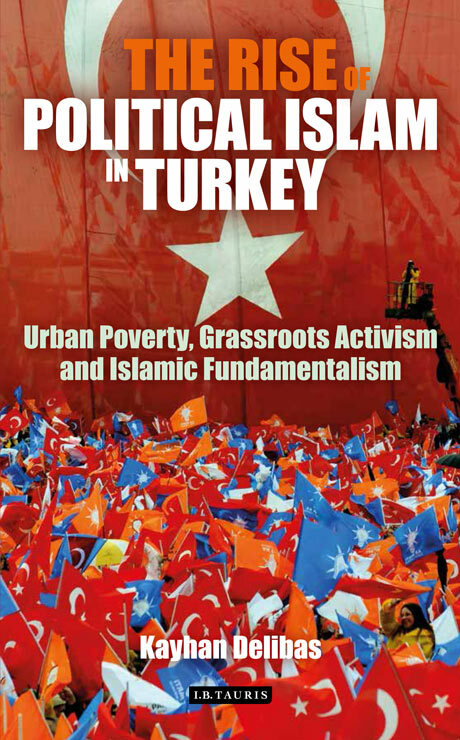 Those known to be close to the government, or the Gülen movement, were the only national newspapers to feature Cihan’s story. 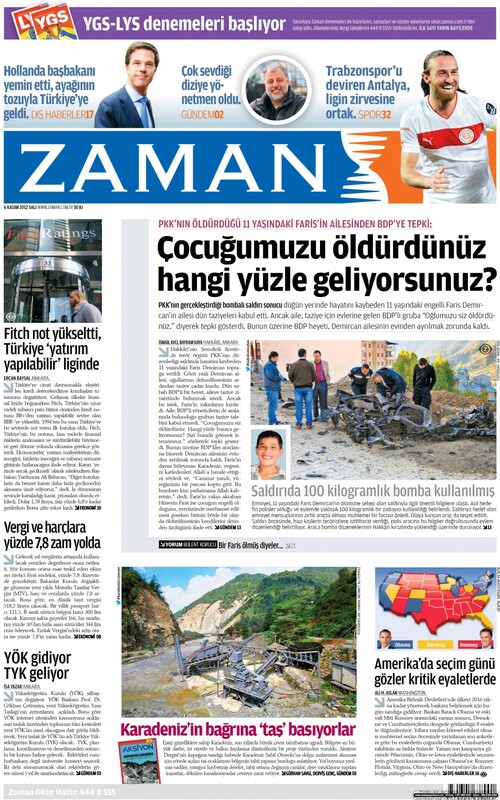 Zaman included it as their main front page story, under the headline: “Family of 11-year-old Faris respond to the BDP: ‘You killed our child, how dare you come here’”. BDP deputy Canan has written a formal letter of complaint – which I have read (anybody interested can contact me) – to Cihan news agency about its “baseless” report. In the letter, he says that his visit was in fact accepted by the family of the deceased, and he claims that Cihan’s news was written without any examination of the area and without any correspondent on the ground. He demands a retraction and an apology, warning that he will exercise his full legal rights to pursue the case if he does not receive one.